Funded by a $10,000 ASCO State Affiliate Grant and an $11,700 NNECOS grant, the Clinical Trials Barrier Study was led by principal investigator Dr. Doug Weckstein. From October 2008 through April 2010, the participating practice sites identified eligible patients from consecutive cohorts of patients. The sites issued surveys to 1,741 patients. Of those patients returning surveys, 213 were eligible for a clinical trial at their practice site, but elected not to participate in a trial. 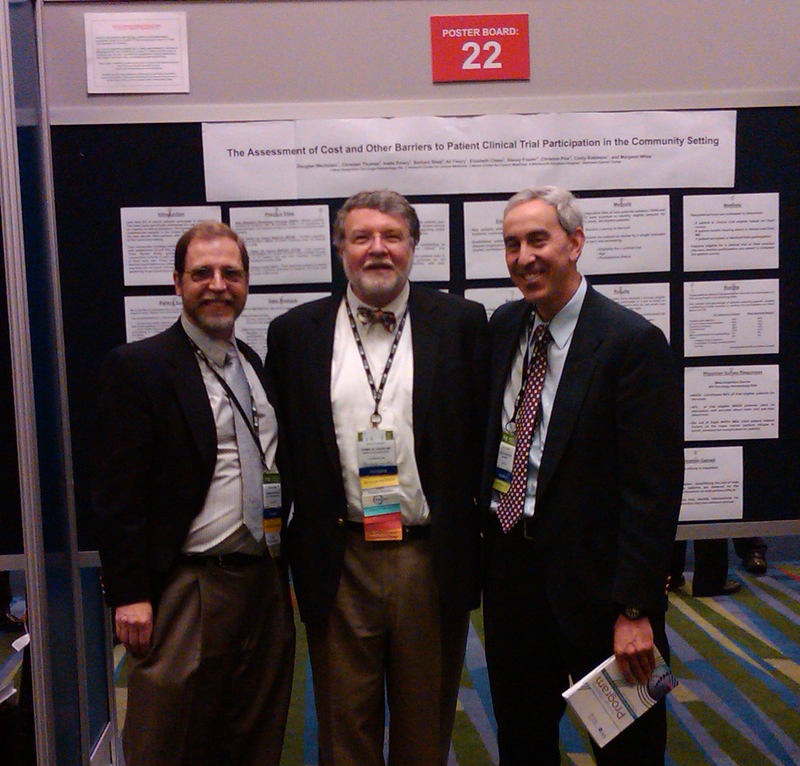 Dr. Weckstein presented a poster at the 2010 ASCO Annual Meeting in Chicago, IL (pictured left with past NNECOS president Dr. Andy Hertler, and current ASCO CPC Chair Dr. Dan Hayes), and shared an enlightening lunchtime presentation at the 2010 NNECOS Annual Meeting in Stowe, VT.
ASCO's Journal of Oncology Practice published a manuscript by Dr. Weckstein on this study (Assessment of Perceived Cost to the Patient and Other Barriers to Clinical Trial Participation). (CCOP) Research Base Annual Investigator’s Meeting in March 2011. View Dr. Weckstein's presentation from the 2010 annual meeting.